Despite the low flows and droughts the users of the Colorado River have not had to cut back much. In 2001 the lower basin states (Arizona, California, Nevada) and Mexico used 9.974 million acre feet (maf) of water. In 2017 the lower basin states and Mexico used 8.296 maf. The August 16 report that prompted the associated press news story projects that there will be no cutbacks in 2019 either. Being news organizations they made the 52% chance of cutback in 2020 their headline, because fear doom and gloom sell better than hotcakes. Weirdly. Myself, I prefer a nice stack of wheaty cakes with butter to bad news. 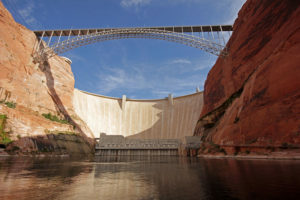 Under the current rules if Lake Mead is lower than 1075 above sea level on January 1 of a year then there will be mandatory cuts of 320,000 acre-feet for Arizona, 13,000 acre-feet for Nevada, and 50,000 acre-feet for Mexico. That is 11.4% of the water Arizona uses in a year, so now is not the time to get a vacation home in the Valley of the Sun. We here in Colorado and the other upper basin states will not feel the pinch directly unless Lake Powell runs dry. We are obligated under the Colorado River Compact to ensure there is at lest 8.2 million acre feet of water for the lower basin to use each year (7.5 for the states and 0.7 for Mexico). Then it is possible that we will have to cut back, though it gets complex because it is an average over 10 years. In most years up to now we’ve actually been sending 9.0 maf down the river so there is a potential cushion depending on how lawyers interpret the agreement. Needless to say if the lower basin decided to invoke a “call” on the river it would head to court at a speed somewhat faster than bad news, itself known for breaking the speed of light under laboratory conditions. The bottom line we are fine for now and sitting at around a 50-50 chance of mandatory cutbacks in 2020 for Arizona, Nevada, and Mexico. Further out it gets even more murky with the potential for everyone feeling parched if the winter snow average does not improve. A bit closer to home, as a Denver resident reviewing the recently posted Blueprint Denver 2040 visioning plans to support up to 900,000 Denver residents by 2040, I'm wondering how the steadily declining snowpack will impact us? Each well drilled requires 1 million to 5 million gallons of water, and more when they are refracked. Drillers “may need more water than we have,” said John McGee, water manager for the city of Loveland, which has leased municipal water. Water (especially clean water) is the number one issue threatening not just our region, but likely much of the world as global warming takes its toll, with Luddite politicians refusing to recognize the problems, much less attempt to address them. The decline is not steady. It is low for four years and then above even the old average for one. Or even catastrophically heavy as with the rain in 2013. And what happened to Chatfield in 2015 (yay big government for no flooding in Denver). Provided we have enough storage the wet years can somewhat even out the dry ones, though the overall water available may be less. Denver and Denver Water have the enviable position of having extremely senior water rights. In a crisis Denver is likely to play nice with the other users and cut back to help others, but a lot of Denver's water is senior to agricultural uses due to the purchases of very early ditches and projects. So if Denver wanted to play "hard ball" then it would be the junior water rights that would just be out of luck. Cities can also afford to pay more than Ag users. The economic activity from water use in the city is huge and the amount end users pay is much, much higher explaining how they can "buy and dry" farms in order to water lawns in Aurora. I once started trying to figure out how likely a Cape Town water crisis for Denver would be with the dams going dry after a long drought and city water nearly being turned off. It turned out to be a very hard question to figure out as a non-water expert. The plans Denver Water has in place for a drought seem very well thought out and they are expanding storage so we will have a larger water savings account. The giant question mark is if nature might do something that seemed impossible. Thanks for great diary and follow-up comments, Denependent. The hard truth is that cities will buy the ag water. That said, we have a lot of technological options these days to grow food with substantially less water than we use today, but that would require us to do things like change the entire focus of federal policy via the Farm Bill. At the very least, carve out and create policy that deals directly with the food/energy/urban nexus in the water-starved western states. Ran across this gem reading through the old diary: Who'd have thunk? Dems and terrorists paling around, plotting the demise of Colorado? Agreed, Denver probably is in a better situation than those downstream (although water storage capacity appears to be mostly below Denver, meaning we are dependent on snowfall levels regardless of any water compact rights). Here is a 2017 study predicting a likely 30% overall reduction in water through 2040. So if just Denver grows our population by 30% in that time, but has 30% less water to work with, while it won't be great news for us, I can only imagine the crisis for outlying communities, much less Ag and O&G. Population growth does not mean water usage will grow. Between 1979 and 2014 the population of Denver went up by 350,000 people. Water usage slightly dropped. (Denver Post, 2015) There is a lot of conservation work behind those numbers and technology, but one of the fundamentals is that people in apartments and condos use less water than people in single family homes. The landscaping is the big user and even when we keep landscaping big gains can be made in having smarter choices. The Dog Tuff grass and buffalo grass instead of bluegrass can reduce water demanded by a lawn by 40%. The Denver Water Drought Plan is an interesting read for understanding why government makes its choices. What they did to figure out how much capacity Denver needs is used the amount of water that fell in the basin between 1634-2016. Then they added an additional half year supply on top of that so coming up with a capacity of 550,000 acre-feet. Enough water when full to provide Denver Water customers with all the water they need for a year and a half even if nothing else comes into the system. Now, this could all be for naught since things are a changing. But the plan of what to do if we start running low seems solid. We may end up losing all the bluegrass, but I think the city would do well even in a prolonged drought. Probably. Good news/bad news. The efficiency gains cited in that article reflect a switch from 3.5 gal/flush to 1.5 gal/flush toilets. That improvement has run it's course, as every added new home with new residents start with the more efficient fixtures, so while per capita consumption might drop slightly, it will be overwhelmed by the number of net new residents. My best friend just bought a full size single family home in Stapleton that has only a minimal back yard (but for having two of the cutest new puppies, he would have just extended his concrete patio in lieu of any grass). It's got just about every efficiency trick in the book, so I'll be interested to see his utility bills for a larger home. When we moved from Aurora to Denver back in 1994, our realtor who had over 30 years experience warned us about all the people building homes on the southeast side towards Parker, Castle Pines, etc. since water even then was getting expensive and scarce. There are folks in Cherry Hills that are probably regretting having huge grassy lots, even with wells that they have to keep digging deeper. Everyone buying on a well is rolling the dice and should start saving for the new well. I recall proposed legislation a few years back (2004? or 5?) that said sellers had to estimate the life of the water supply, and there was a required discloure if the estimate was less than 5 years. That failed- real estate agents and outer commute ring counties didn't want it. And then just recently – just before the woefully inadequate C470 expansion – Douglas County went to court and the result was that developers could get water as they built/sold, but didn't need to show a source at the start of a project. Ha! Yes, I'm looking at you Sterling Ranch. Meanwhile the last damn built on spec is going to fill with 'treated' sewage. Yes – Reuter Hess has no fresh water of it's own. Really interesting, dare I say, "Refreshing" take on a complex subject -water usage and lose-age in Colorado. Thanks. U.S. Geological Survey maps show Colorado sits above a vast ocean of brackish water. In a pinch, that will do for fracking, albeit at a somewhat higher cost. But farmers can't use such brackish water, so we again need to look for less thirsty crops, such as hemp, to replace irrigated ones like corn. As long as you don't even think of dewatering Olathe sweet corn! Number 1 waterpriority: Olathe sweet corn. Number 2 : Rocky Ford melons. Hey! What about the peaches man? The corn is good, but I would go to the stake for peaches. Finally, that pure Wester n Slope apple juice\apple cider. Something about skyland fruit makes fo r incredibly good juice. Personally, I think Talbott's is better. Where do you find it? It can be hard to get Western Slope delicacies in Denver. Try King Soopers. City Market carries it over here. If I recall correctly, over half of CO water goes to pastures and alfalfa. That's a pretty low rate of return for water. The Colorado Independent has an in-depth look at our slowly growing water crisis. A NASA report has found that drought conditions are becoming more common in the Western U.S. Several water experts at this week’s conference scoffed at the term “drought,” preferring instead “aridification,” meaning not just a lack of rainfall, but a wholescale transformation of Western land into a drier landscape. Colorado is expected to warm 2.5 degrees Fahrenheit by 2050 due to climate change, according to a Western Water Assessment study. As a parable for what to expect, the Water Congress held a panel discussion about Cape Town, a South African city of four million people that nearly ran out of water earlier this year. The Statewide Water Supply Initiative (SWSI), which previously predicted Colorado will run out of water in 2050, began in 2016. A full, updated report is long overdue and now expected in July of 2019. "… will not feel the pinch directly unless Lake Powell runs dry. " "… if Lake Mead is lower than 1075 above sea level on January 1 of a year then there will be mandatory cuts …"
Is there additional upstream to be sure? It ain't enough – and Utah wants a pipeline project. The monsoon is just about over. I wouldn't expect Powell or Mead to fill between now and January. Maybe a new Monkey Wrench Gang will be unnecessary. Between all the silting and the low water, it (the Glen Canyon dam) could be pretty useless, pretty soon.